← LEAVING A LASTING INHERITANCE?! God never ceases to amaze me! Sometimes it’s difficult to trust Him primarily because it’s uncomfortable to trust what I don’t know nor understand. However, one thing is certain, He always knows what’s best and He never will leads us to destruction. Romans 8:27-29 (Msg) put it this way, “He knows us far better than we know ourselves, knows our pregnant condition, and keeps us present before God. That’s why we can be so sure that every detail in our lives of love for God is worked into something good. God knew what he was doing from the very beginning. He decided from the outset to shape the lives of those who love him along the same lines as the life of his Son. The Son stands first in the line of humanity he restored. We see the original and intended shape of our lives there in him.” So be encouraged today and know that God always has your best interest in mind. 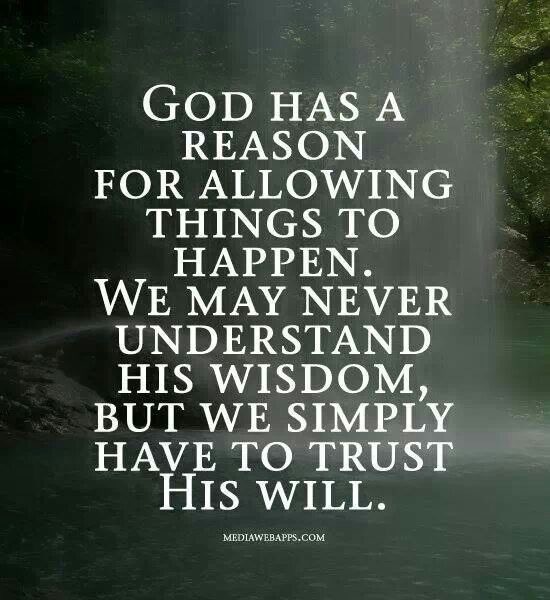 We may never understand God’s wisdom but we simply must to trust His will!